Juice all your citrus without creating waste or mess. This reamer fits snugly atop a base that catches every drop. Won't wiggle out of place, but instead sits firmly on the rim. Lets you keep an eye on the amount as liquids collect in the translucent reservoir and the integrated pour spout and handle make for mess-free transfers. 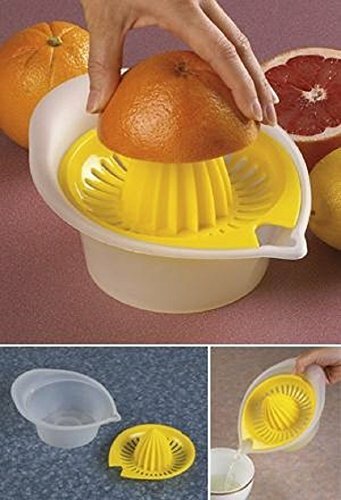 Accommodates limes, lemons, oranges and grapefruit, and efficiently filters out seeds. About 8"L x 6-1/8"W x 4"H; holds about 2 cups. Dishwasher-safe polypropylene. BPA free. Juice all your citrus without creating waste or mess. This reamer fits snugly atop a base that catches every drop. Won’t wiggle out of place, but instead sits firmly on the rim. Lets you keep an eye on the amount as liquids collect in the translucent reservoir and the integrated pour spout and handle make for mess-free transfers. Accommodates limes, lemons, oranges and grapefruit, and efficiently filters out seeds. About 8″L x 6-1/8″W x 4″H; holds about 2 cups. Dishwasher-safe polypropylene. BPA free.